In the summer of 1963, 15 young civil rights activists (ages 12 to 15) were illegally imprisoned for two months. They were part of a group of 200 people peacefully protesting segregation when they were hauled off to jail in Dawson, Georgia. The following day, they were shuttled to an abandoned, one-room stockade in Leesburg, Georgia - all without their parents' knowledge. There, they were held against their will for two months, without bedding, fresh clothes, sanitary products, adequate food, or working plumbing. They were finally released after photographs of their plight surfaced, but their story quickly faded into obscurity. Now, 50 years later, these women are breaking their silence to bring awareness to the small, powerful actions of peace that have helped shape this country. The Presidential Medal of Freedom is awarded yearly to individuals or groups who have made "especially meritorious contributions to the... national interests of the United States, to world peace, or to cultural or other significant public or private endeavors." The Leesburg Stockade Girls sacrificed two months of their young lives by taking a stand all those years ago. Their contributions to the civil rights movement cannot go unnoticed! Sign the petition urging President Trump to award this medal to the nine remaining women of the Leesburg Stockade, and to posthumously award it to the six that have passed away. Diane Dorsey-Bowens, Melinda Jones-Williams, Mae Smith-Davis, Verna Hollis, Lulu Westbrooks-Griffin, Emmarene Kaigler-Streeter, Dr. Carol Barner-Seay, Dr. Shirley Green-Reese, Laura Ruff-Saunders, Billie Jo Thorton-Allen, Sandra Russell-Mansfield, Annie Lou Ragans-Laster, Gloria Westbrooks-Breedlove, and Pearl Brown. In April of 2016, Congressman Sanford Bishop, Congressman John Lewis, and Congressman Hank Johnson, all of Georgia, also wrote you with the same request. We believe in the power of the people to enact change. The egregious treatment these 15 girls suffered during the summer of 1963 was a direct result of their peaceful protest against segregation. At the tender ages of 12-15, these girls were youthful, impressionable, and passionate about equal rights. They sacrificed two months of their lives in pursuit of these rights, and the physical and emotional ramifications of the events that transpired have stayed with them their whole lives. They were illegally imprisoned in the abandoned stockade in Leesburg for two months, without proper nutrition, clean water, working plumbing, sanitary products, or bedding. Their parents were unaware of their whereabouts. 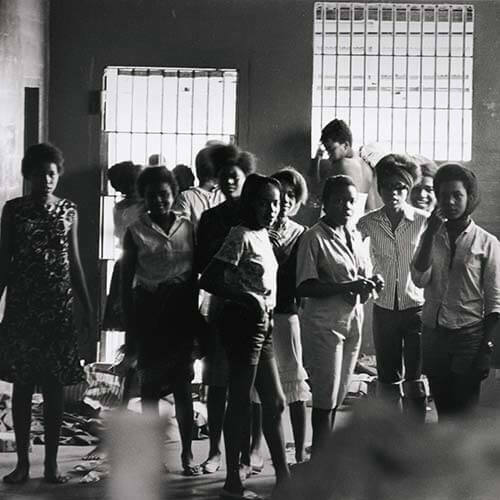 They were finally released, quietly and without fanfare, after a photographer for the Student Nonviolent Coordination Committee, Danny Lyon, published photos of the girls' situation. The authorities responsible for their imprisonment were never punished. Now they are breaking their silence about Leesburg in order to shine a light on the influential actions of young people during the civil rights movement. Their sacrifices have remained unacknowledged for too long. Only 9 of the 15 women are alive today, but we believe all 15 women deserve this honor. It is our hope that you, too, see the bravery and nobility of these women, and recognize their nonviolent methods of protest at such a volatile point in our nation's history with the Presidential Medal of Freedom. We believe that awarding these women this medal will help further the equality movement to address the problems that unfortunately still exist in our nation today. Thank you for your consideration of our request. That's 8,240 signatures! Let's keep the ball rolling.